"Look me in the eye when I'm talking to you." STX Entertainment has debuted the official trailer for action movie The Limit, one of the first ever commercially-released VR movies. The running time on this seems to vary - the official info states it's only 20 minutes, but IMDb says it's 45 minutes. The Limit is a new 180° VR feature, which you can load onto your VR devices for viewing. Michelle Rodriguez stars as a "genetically enhanced weapon of mass destruction", who goes back to destroy the place that made her. How original. This seems to be Rodriguez and STX banking on VR movies as the future, and putting this together as a trial run for what's possible and how easy/fun/entertaining it is to make an action movie like this. 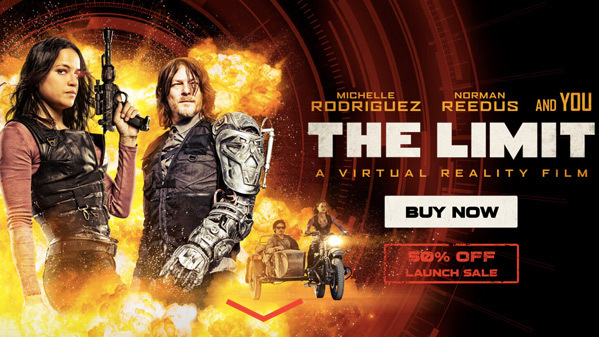 The Limit also stars Norman Reedus and "You". This could turn out cool? Jump right in and let us know what you think. Michelle Rodriguez plays a genetically enhanced weapon of mass destruction, and sets out to destroy the secret agency that created her. Enter a new world of storytelling in this blockbuster "immersive cinema" experience from visionary filmmaker Robert Rodriguez. As a rogue agent with a mysterious past, you enlist the help of enhanced super-assassin M-13 (Rodriguez) to retrieve your identity and strike against the deadly organization that created you. The Limit is both written and directed by filmmaker Robert Rodriguez, who is also finishing up the feature film Alita: Battle Angel. The release online includes the full 3D and 2D versions of the film, 2 featurettes, director's commentary and more. If you're interested, the film is available for VR platforms now from the official website. Thoughts? Is this really the future of cinema?